This is the IUCN’s 365th species for 2010. 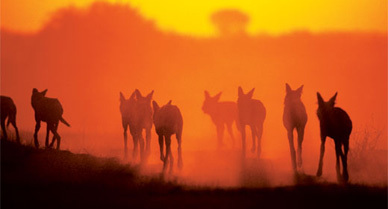 I love this picture…wish I could be there alongside them, trotting into that dusty sunset. What a beautiful animal to share New Year’s eve with. Tomorrow I will look back a little at some of the incredible creatures (and plants) that really hit a nerve for me…and then I will set my sights on 2011. 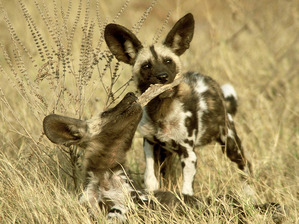 The African Wild Dog is Endangered. This species is limited to only a portion of its historical distribution, with populations eradicated from West Africa and greatly reduced in central and north-east Africa. They are rarely seen due to their low population densities. Wild Dogs experience high mortality in comparison with other large carnivore species.While competition from other predators, primarily lions, is the principal cause of natural mortality in adults, more than half of all deaths are due to human activity. Wild Dogs ranging outside of protected areas encounter high-speed vehicles, guns, snares, and poisons, as well as domestic dogs, which represent reservoirs of potentially lethal diseases (rabies and canine distemper). The establishment of protected areas, as well as conservancies on private and communal land, has decreased contact between Wild Dogs, people, and domestic dogs. There are also efforts to work with local people to reduce deliberate killing of the dogs in and around these protected areas. Establishing effective techniques for protecting small populations from serious infections is also a priority. This entry was posted in Species. Bookmark the permalink. I will never forget the privilige of observing these wonderful animals in Botswana/Okavango, as they interacted with the pack outside their den before a group took off on a hunt, splitting up and disappearing into the night, jogging tirelessly. Their social system is a lesson in physical communication, their young protected at all times until old enough to move away. Again, wonderful work! Looking forward to tomorrow’s highlights and next year’s path, wherever it might lead!